The Tigard boys basketball team knows that it's got a target on its back. The Tigers, unbeaten in the Three Rivers League and ranked seventh in the state, know they're going to get everybody's best shot — and that's just what they got on Friday night. Tigard, playing at Lakeridge in TRL action, saw the Pacers grab the lead at halftime and hold it until midway in the third period, before the Tigers finally pulled away to win 69-59 at Lakeridge High School. "It feels good to keep the momentum going into next week's games," said Tigard sophomore wing Drew Carter, who led all scorers with 26 points on 7 of 11 shooting from the field (including three 3-pointers) and a 5 of 10 day at the free throw line. "We're just trying to build every week and I think we had a good team effort tonight." "We'll just try to keep it rolling from here and have good practices because we've got (Lake Oswego) next week and Tualatin so it will be a tough week," said Tigard senior wing Jazz Ross, who added nine points of 4 of 9 shooting from the floor (including one "3") and five assists. "So this win, it was good to get a little momentum going into those games." With the win — the team's fifth straight — the Tigers improved to 3-0 in TRL play (tied for first with Lake Oswego) and 10-5 overall. The No. 34 Pacers — who played without starters Noa Bothe (illness) and Nima Vaday (injury) lost their sixth straight game and fell to 0-4 in league and 6-9 overall. "At halftime, we were up by three (but) we weren't even playing up to what we thought we could so we thought we could pick it up even more," said Lakeridge senior guard Lawrence Chen, who led his team with 15 points on 5 of 7 shooting from the field (including two 3-pointers) and a 3 of 4 day at the line. "That ended up not really happening in the third quarter and some of that was due to our own mistakes, whether it was just boxing out or some untimely foul calls." 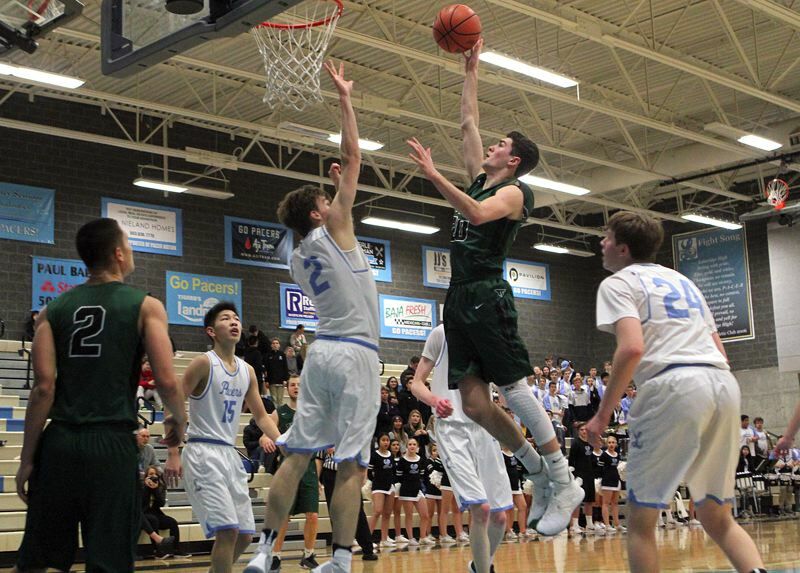 "Some things didn't go our way but we didn't put our heads down," said Lakeridge senior Charlie Maynes, who scored all six of his points in the second half. "Like I said earlier, it didn't fall our way today but we'll get them next time." The two teams traded baskets throughout the first quarter, with Lakeridge's Mason Nelson scoring all seven of his points in the frame while Carter went off for nine in the period and Ross five to help the Tigers lead 14-13. The second period was even closer, featuring four ties and three lead changes and the Pacers taking their biggest advantage at 30-25 when Ryan White scored on the fast break with 32 seconds left in the half. Chen hit 3 of 4 shots from the floor (including one 3-pointer) and poured in seven points in the frame, while teammate Ryan White added five points and Cooper Justice four. For Tigard, senior Stevie Schlabach — after not playing the first quarter — broke through for six points to keep his team within 30-27 at the half. The Pacers were still ahead 36-33 when White took a Maynes pass and buried a "3" from the right corner with 4:35 to go in the period, but Tigard took over in the remaining minutes. Indeed, the Tigers strung together a 14-5 run over the final 3:45 of the stanza, getting a three-point play and nine points in that stretch from Schlabach, while Carter hit a "3" and added five points to give the Tigers a 47-41 lead entering the fourth quarter. Tigard then pushed its lead to 59-45 midway through the fourth quarter when Jake Bullard made a steal and scored on the break with 3:47 left to play. The Pacers closed within 59-51 on a Maynes three-point play with 2:37 to go, but they got no closer the rest of the way. "Lakeridge played hard — my hat's off to them — so it's a great team win," Carter said. "They have a really good student section and the environment was really loud so it was a good learning experience for us because we might see those kinds of environments later on," Ross added. On their side of the ledger, the Pacers lamented the loss but celebrated their solid effort. "When we started falling behind, we called some timeouts and we got back in the game together as a team," Chen said. "We had some untimely foul calls, we got in a lot of foul trouble, … but you've got to play through it. You can't control that. All you can control is your effort." "We are warriors. We like to battle," Maynes said. "We kept working and that's what we strive for every day in practice and I think it shows in the game." For the game, Schlabach added 17 and Diego Lopez 11 for Tigard, while Nelson and Justice had seven each for the Pacers.